Journey around the Galapagos Islands on this 8 day cruise aboard the Evolution Galapagos cruise. The M/V Evolution operates 2 separate itineraries, the Western Islands and the Eastern Islands. These 8 day / 7 night itineraries run Saturday-to-Saturday and alternate each week. 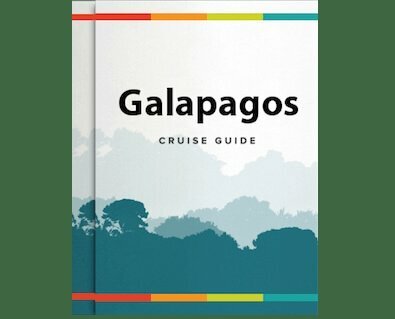 Through our complete itineraries, guests are able to see all of the Galapagos wildlife that made the Islands famous, and inspired Charles Darwin’s theory of evolution. You can also combine these itineraries back-to-back to experience one, all encompassing two week long voyage. AM: Today we fly to San Cristobal Island in the Galapagos in the morning. Flight time is just under two hours from the mainland. Upon arrival we board M/Y Grace where you will have lunch and a quick briefing en route to our first visitor sites: Isla Lobos. PM: Lobos, lives up to its name of -Sea Lion Island- with its noisy population of frolicking and barking beasts. It lies just a short navigation north, up the west coast of San Cristobal, separated by a channel that forms an inviting lagoon. This is where you'll have your first chance to share the water with a playful colony of the "wolves of the sea". From lobos we should have views of Kicker Rock, a spectacular formation that rises 152 meters (500 feet) out of the Pacific. It takes the form of a sleeping lion, but from another angle you can see that the rock is split, forming a colossal tablet and, piercing the sea, a great chisel ready for etching. After this visit you have time for a shower as we get ready for our welcome cocktail and our first formal briefing before dinner. AM: Hood is the southernmost island of the archipelago, and is one of the most popular due to the breathtaking variation and number of fauna that inhabit the island. In the morning we visit Punta Suarez where you will witness the largest variety of marine iguanas in the Galapagos, masked boobies and blue footed boobies nesting along the cliff’s edge, as well as the famous waved albatross. PM: In the afternoon we visit Gardner Bay, a magnificent long white sandy beach, where colonies of sea lions laze in the sun, sea turtles swim offshore, and inquisitive mockingbirds boldly investigate new arrivals. AM: Floreana has had a colorful history: Pirates, whalers, convicts, and a small band of somewhat peculiar colonists—a Baroness among them—who chose a Robinson Crusoe existence that ended in mystery and death. We visit Post Office Bay, where in 1793 British whalers set up a barrel as the island's Post Office, to send letters home on passing ships. The tradition continues to this day, simply by dropping a postcard into the barrel without a stamp. PM: Afternoon visit to Punta Cormorant which offers two highly contrasting beaches; a green-olivine beach and an iron-red beach. Between the two beaches is a salt lagoon frequented by flamingos, pintails, stilts and other wading birds. Late afternoon snorkeling at Champion Islet, which is home to a myriad of marine species including a variety of pencil sea urchin, wrasses, angelfish and amberjacks. Look for sea lions, rays, white-tipped reef sharks, and sea turtles. AM: Santa Cruz is the second largest island in the Galapagos and its capital, Puerto Ayora, is the economic center of the Islands. In the morning we visit the Charles Darwin Research Station to visit the Giant Tortoise and Land Iguana Breeding and Rearing Program. Here we used to find Lonesome George (now deceased), the last of his particular race of tortoise. PM: In the afternoon we are off to the Highlands of Santa Cruz, where the dry coastal vegetation transitions to lush wet fields and forests overgrown with moss and lichens. Our destination is the Tortoise Reserve, where we will have chances see these animals in the wild, walk through lava tubes and see the Gemelos, twin collapsed craters. AM: In the morning we visit Las Bachas, a sandy white-coral beach that is a major egg-laying site for sea turtles. The name Bachas refers to the remains of landing craft left here at the end of WWII. Ashore marine iguanas mingle with flamingos and other wading birds in another of the many super saline lagoons found in the Galapagos. PM: Chinese Hat Islet, a fairly recent volcanic cone, has the shape of a down-facing Chinese hat for which it is named. On the rocky shoreline of nearby Santiago island, Galapagos penguins dot the coast. There is a small sea lion cove on the north shore, where boats anchor and land at the visitor site. Late afternoon snorkeling with sea lions and penguins and swimming opportunities in the cove. AM: Rabida Island, commonly known by its English name of Jervis, is unique for the very red color of the beach and cliffs, beneath which one can find gliding sea turtles and perched blue footed boobies. A thick forest of Palo Santo trees sits back from the beach sheltering a yellow saltwater lagoon. Pelicans nest in the thickets and brightly colored pink flamingoes graze the lagoon. A sea lion colony likes to laze on the red sands of the beach. We hike up a tiny peninsula for a wonderful view of the beach and lagoon. Sea caves invite exploration further down the coast. PM: Afternoon visit to Sullivan Bay, one of the most outstanding volcanic sites in the Galapagos. In the nearly 100 years since the Sullivan Bay Flow, only a few plants like Mollugo and Lava cacti have managed to take root in this harsh environment. Oystercatchers can be seen fishing for crabs and mollusks in the tide pools of Sullivan Bay. After exploring the lava flow, there is swimming and snorkeling with playful sea lions off two small coralline beaches. AM: In the morning we visit Bartolome Island, famous for Pinnacle Rock, where we will see Galapagos Penguins and sea lions. We will also hike a trail to Bartolome’s summit where you will be rewarded with spectacular views of Pinnacle Rock and our beach, where the crystal blue waters of the bay cradle your yacht. PM: Afternoon visit to North Seymour, a good nesting site for frigate birds and Blue-footed boobies. The Island was lifted from the ocean floor by a seismic event, and its origins as a seabed give the island its low, flat profile. This island is teeming with life! You might have to give way to a passing sea lion or marine iguana; blue-footed booby nests sit beside the trail where mating pairs perform their courtship dance. A tiny forest of silver-grey Palo Santo trees stand just above the landing, usually without leaves, waiting for the rain to bring them into bloom. AM: Today your Galapagos cruise comes to an end, but before we bid farewell to the Grace we visit Black Turtle Cove, a mangrove estuary on the northern shores of Santa Cruz Island. We visit the cove via panga (local dinghy) but with the engines turned off. Many rays, sea turtles, pelicans and other wildlife live among the mangroves. Next we return to the airport where we began our journey in the Galapagos for the flight back to the Ecuadorian mainland.